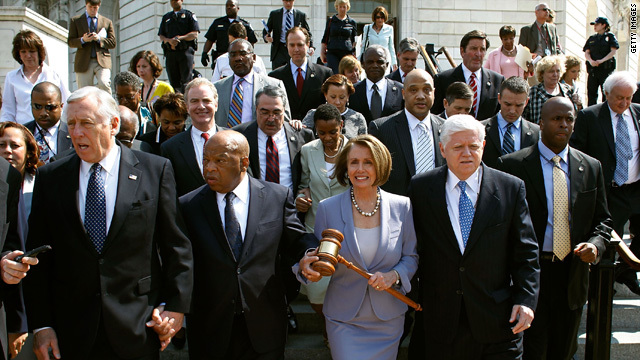 Pelosi emerges as powerhouse in D.C.
Speaker of the House Rep. Nancy Pelosi, D-California, carries the gavel that was used when Medicare was passed while walking with other congressional Democrats to the Capitol before the health care vote Sunday. Princeton, New Jersey (CNN) -- The passage of health care will certainly rank as one of the major political achievements of recent decades. Legislation that will eventually extend health care coverage to more than 30 million more Americans, greatly expand the number of options that citizens have when purchasing health care, bring healthy citizens into the pool of the insured and thus lower costs and create important regulations on health care companies will be remembered as one of the biggest domestic policy changes since the Great Society of the 1960s. While most attention will focus on President Obama for pulling off a Herculean task that eluded many of our great presidents, U.S. House Speaker Nancy Pelosi emerges from this battle as the real powerhouse in Washington. She has pursued a clear ideological agenda but through pragmatic political tactics. Like the late Sen. Ted Kennedy, she stands for something, yet knows how to round up votes. Since the 2008 election, Pelosi has been the most reliable leader Democrats have had. She has delivered on almost all of the legislation that the White House sent to Congress, even as her colleagues found themselves frustrated by a Senate that seemed incapable of governance. At three critical points in the health care debate, Pelosi delivered. First, she assembled a center-left coalition around the original House bill in November by pushing through a controversial amendment related to abortion that brought moderate Democrats on board with the legislation. Second, when many Democrats, including top presidential advisers such as Rahm Emanuel, contemplated breaking up the bill after the Massachusetts election, Pelosi stood firm and defended holistic reform. She "kept the steel in the President's back," Democrat Rep. Anna Eshoo told Politico. Finally, in the past week she displayed the kind of vote-gathering skills that have been displayed by legendary figures such as Speaker Sam Rayburn of Texas. From the start of Obama's presidency, Pelosi has argued that Democrats should focus on maintaining partisan unity rather than on achieving bipartisan coalitions. She has implored her colleagues to act with confidence rather than out of fear. Her goal has always been to find ways to keep Democrats together rather than bringing Republicans on board. In an era where partisan polarization makes true bipartisanship impossible, this is the most effective and realistic approach for Democrats. Her philosophy echoes the beliefs of another powerful leader who said: "Show me a nation without partisanship, and I'll show you a tyranny. For all its faults, it is partisanship, based on core principles, that clarifies our debates, that prevents one party from straying too far from the mainstream and that constantly refreshes our politics with new ideas and new leaders." That was from a farewell statement by Republican Majority Leader Tom DeLay. Although Americans tend to focus on the presidency and give credit to the office for what does or does not happen, we often ignore the central role that Congress plays. During the 1930s and 1960s, legislators were essential to the success of the New Deal and Great Society, often pushing Presidents Roosevelt and Johnson in directions they were too scared to take. Rather than the cartoonish caricature that Republicans often use of Pelosi as a left coast, left-wing fanatic, she is something much more powerful -- and threatening to their party. When Kennedy died, many Democrats wondered who would take his place as the party's deal-maker. Now they have their answer.